We support our troops - Castellanos Group P.S.C. At Castellanos Group P.S.C. - We support our troops! In 1996, Alfredo Castellanos Esq. was invited by the NAVY as a special guest in the nuclear-powered USS John C. Stennis(CVN-74). He is one of a very few selected civilians to have the privilege of landing and taking off in a US aircraft carrier, to witness active military exercises and to share inspiring experiences with our nation’s heroes. “The U.S. Navy sponsors a Distinguished Visitors Program to increase awareness of the Navy’s mission and highlight the tremendous service of our people. 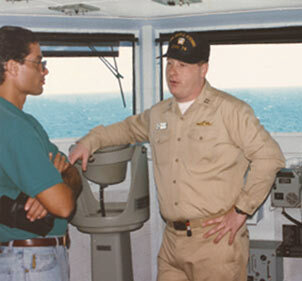 Because opportunities for civilian embarkations on Navy ships and submarines underway are extremely limited, people considered for this program are selected based on their ability to share their experience with the largest possible audience. The NAVY League (Puerto Rico) has honored Alfredo Castellanos Esq. having invited him as the official guest speaker in several prestigious conventions.